The term “collective action” was often referred to during IRC’s recent All systems go! symposium, the first international gathering dedicated entirely to the theory and application of systems thinking in the water, sanitation and hygiene (WASH) sector. One foundational element of systems thinking is that diverse sets of actors need to come together, playing well-defined and specialised roles in a way that is mutually reinforcing, symbiotic, and ultimately sustaining. An appreciation that it takes a collective effort to achieve lasting and universal WASH services, be it handpumps that are routinely maintained and repaired with minimal downtime or thriving sanitation marketplaces that meet the needs of everyone. This is the essence of what is termed collective action. In his opening plenary address, IRC’s CEO Patrick Moriarty suggested collective action as a defining characteristic of effective WASH service delivery systems. But what does collective action look like in practice, and how is it different from business as usual? IRC CEO Patrick Moriarty speaking at the opening plenary of All systems go! As the only session at the conference dedicated to the topic, we began the discussion by offering a working definition, which reads as follows: a facilitated approach to strengthening the coordination, trust and cooperation among a diverse set of stakeholders toward achieving a shared outcome. Collective action in WASH aims to, as one attendee put it, “get people on the same page” to develop a common understanding of the challenges they are facing, define expectations, align objectives and commit resources towards achieving a common goal. It’s the “grease” that supports the groups (and interests) operating in a system to engage with each other more effectively, learn, adapt and improve. "Collective action is a facilitated approach to strengthening the coordination, trust and cooperation among a diverse set of stakeholders towards achieving a shared outcome." In this way, collective action approaches fundamentally differ from conventional stakeholder coordination and knowledge sharing fora in the WASH sector (e.g. working groups, Joint Sector Reviews) which encourage stakeholder collaboration but often lack a well-defined scope and fall short of a commitment to joint action and transformational change. Instead, collective action focuses on a clearly defined objective, involve centralised infrastructure and dedicated staff, and commit to a structured learning process characterised by a common agenda, shared measurement, continuous communication, and mutually reinforcing activities among all participants. Using collective action concepts to address “wicked” social challenges is not new, having appeared in literature from the United States, Canada and Australia in one form or another for over the last decade. The concept of collective impact has been particularly widely adopted and well-documented in philanthropic circles. On the other hand, collective action in the WASH sector is less common and documentation is thin; however, IRC’s recent Working Paper: How to use learning alliances to achieve systems change at scale documents experiences of leading Learning Alliances in Ghana and Uganda is a welcome addition to the scholarship. Focusing on collective action in WASH is relevant and timely given the complexity of achieving and maintaining universal access to quality WASH services and the widely accepted position that the role of donors and development organisations in the WASH space is fundamentally one of facilitators of change rather than direct service providers. Laura Brunson of Millennium Water Alliance (MWA) presenting her case study from Ethiopia. We designed this session to present and discuss experiences from a diverse group of WASH practitioners from Cambodia (WaterSHED), Ethiopia (Millennium Water Alliance), Ghana (IRC) and Uganda (SNV on behalf of the USAID Uganda Sanitation for Health Activity) attempting to catalyse collective action at national and sub-national levels. Through these case studies, and an overarching presentation of Collective Impact by FSG, the goal of the session was to examine if the theory of collective action is applicable and replicable for tackling WASH service delivery challenges in the global South. 1. Securing political participation and sustained commitment: IRC Ghana’s Country Director, when discussing her experience participating in an ongoing collective action process to achieve universal WASH coverage in one district by 2030, commented on the importance of securing political commitment and participation through continuous communication in many forms: Durbars (meetings organised by traditional leaders), regular stakeholder review meetings, town hall gatherings, Learning Alliance Meetings, and WASH radio programmes. Reflecting on a national effort in Cambodia, WaterSHED suggested it might be appropriate to start a collective action effort with a small group of closely involved actors to first determine the initial approach, structure, level of inclusion, accountability mechanisms, etc. before slowly growing the coalition. This example also highlighted that the collective action concept must be well communicated to government and political decision makers. The panel wondered if collective action could be effective without full government support, while at the same time considering how to sufficiently involve government structures without them taking over and losing some level of independence and inclusion in the process? 2. Importance of hub or backbone support: An opening presentation by FSG, the mission-driven consulting firm that coined the term Collective Impact, stressed the critical role of a backbone or hub organisation to keep the coalition together through continuous communication, convening meetings, documenting progress and supporting shared measurement. In all cases presented, entities external to government were providing backbone support. The importance of an independent backbone was reiterated in presentations from Ghana, where IRC maintains a WASH resource desk to ensure issues from the community are communicated and addressed; and in Ethiopia where the MWA plays the role of a backbone to support work happening by multiple member organisations at the district level. The MWA speaker noted the significant effort that goes into the backbone role, yet without a backbone function the collective action would likely lose momentum and focus very quickly. 3. Relationships are foundational: A recognition that effective collective action is built on strong inter-personal relationships was echoed throughout the discussion. The SNV representative stressed that behind WASH systems are people with relationships. Practitioners need to understand who has these relationships (i.e. the political economy) and build bridges. Others suggested that building and nurturing partnerships is fundamental yet requires huge time investments and a deep-seated willingness to cooperate, which are intangible and difficult to support (financially). In Ethiopia, building and maintaining trust among partners is done while sharing coffee, suggesting that interactions outside of formal meeting spaces are critical and often the most influential to drive the collective’s agenda. In other contexts this has been referred to as the ‘soft power’ to influence - see here an example from the Australian Department of Foreign Affairs and Trade’s Civil Society WASH Fund. 4. Change takes time: The FSG representative reminded the audience that systemic change often takes decades and that the aims of the collective may shift or evolve over time. IRC suggested that collective action processes in Ghana have been supported by different donors for over a decade. Responding to this, a donor representative from DFID challenged the panel asking “how do we know if this is working? We need evidence. What can we measure? As a donor, we cannot wait 10-20 years to know if this is working”. Indeed, it is important that collective action initiatives develop leading indicators or signs on maturation to demonstrate to donors and national stakeholders alike that the forum is gaining traction and making measurable progress. 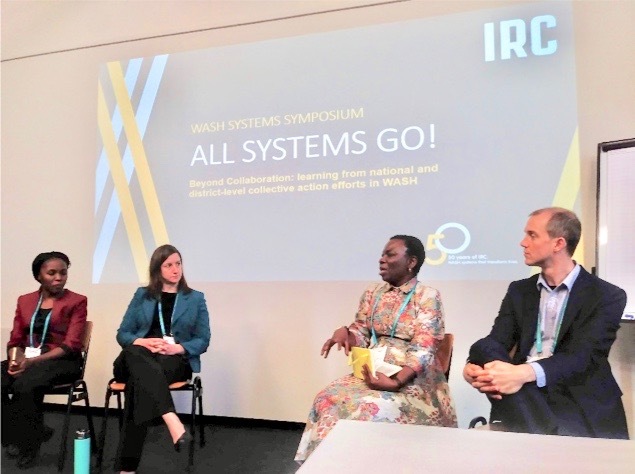 While it’s still too early to know if the case studies presented will lead to lasting change, these discussions suggest that collective action may be a useful approach to addressing deep-rooted and complex WASH service delivery challenges. A wide scale adoption of collective action approaches, however, would have implications for donors and practitioners as the tenants of collective action are inherently contrary to the way much of aid is currently funded and delivered - timelines that are well beyond the traditional project horizons of most bi-lateral donors and progress often measured in soft outcomes rather than numbers of people served which is politically much more ‘sellable’ to constituents. There are other barriers to whole-sale adoption of collective action - specialised technical assistance and training, the tools most commonly offered by donors and practitioners, may be incongruent with the softer skills needed to foster collective action such as facilitation, negotiation, diplomacy and matchmaking. Adopting collective action would compel a re-thinking of roles, methods for engagement and expected timelines for achieving the changes to which we all aspire. It’s an uncomfortable position to be in, but as the MWA representative put it “Collective action is not a whim. We know what was done in the past has not worked and we do know we need to do things differently”. This is about changing business as usual and we could not agree more. Participants at All systems go!